George Edwards was born in Essex England and became one of the most prominent ornithologists of his day, often referred to as the “Father of British Ornithology”. Edwards studied in Holland, but found his true vocation in 1718 when he traveled to Norway and studied the native birds living in the rocks and precipices there. 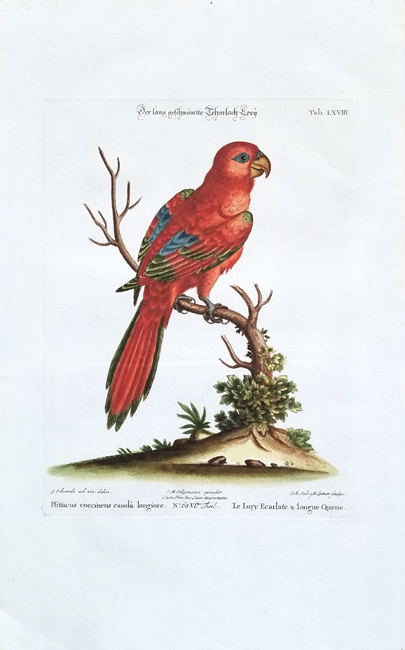 He continued his studies in Holland and Brabant, and in 1773 was appointed Librarian to the Royal College of Physicians while creating his hugely successful series of colored drawings of animals and birds. Johann Michael Seligmann was an engraver and art dealer in Nuremberg, Germany. From 1749-1776, Seligmann re-engraved many of Edward’s plates for his own publication “Sammlung Verschiedener Auslandischer un Seltener Vogel”, with the publishing continuing after his death by his family. The plates, in some cases, had botanical and scenic backgrounds added to them. Seligmann also engraved and published works by other prominent natural history artists including Catesby and Ehret.